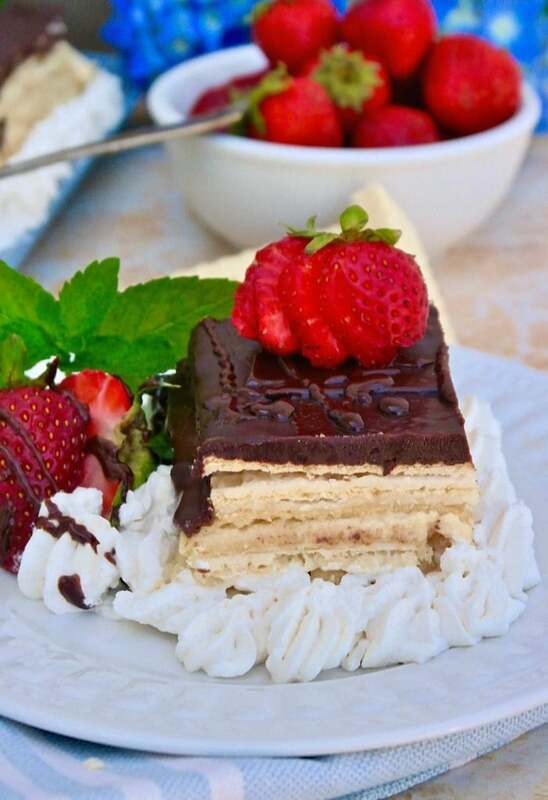 No bake eclair dessert cake with vanilla wafers, homemade pastry cream, and topped with chocolate ganache. Enjoy with fresh fruit and whipped cream! 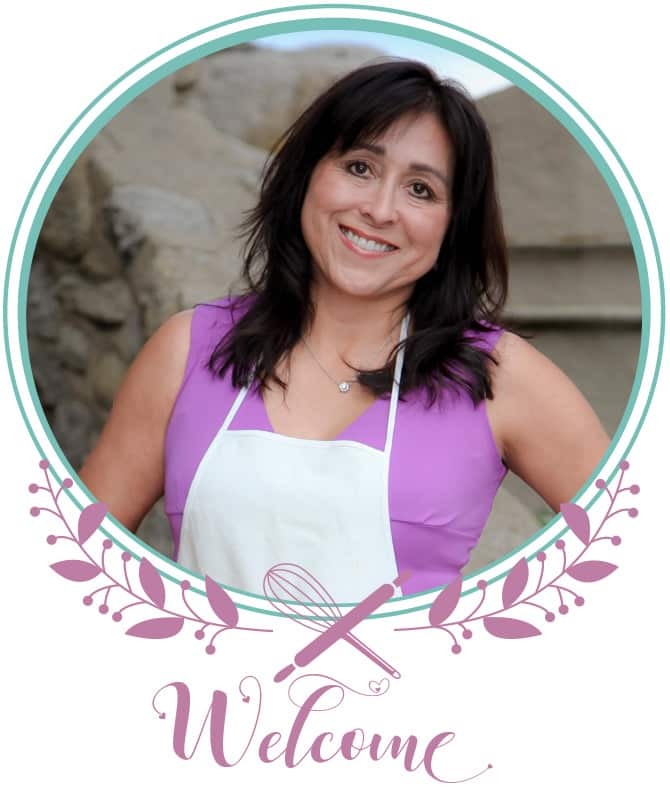 This post is sponsored by Voortman Bakery the Women’s Choice Award for America’s most recommended wafer cookie! The content and opinions expressed below are that of The Foodie Affair. Oh my, you are in for an amazing treat! 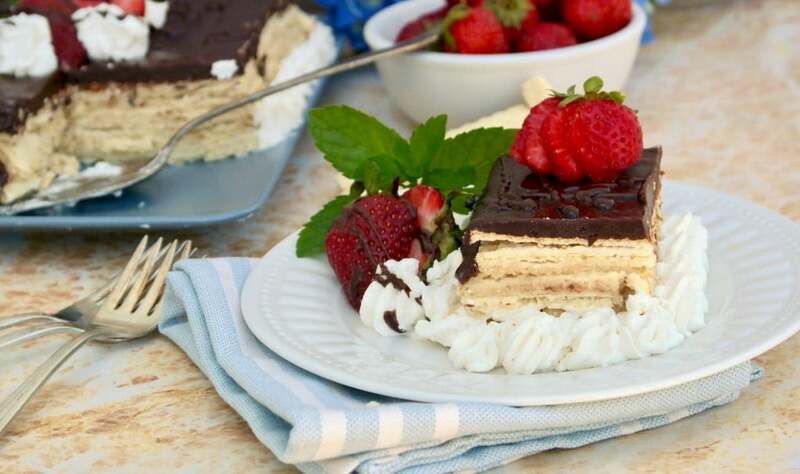 Today I’m sharing a layered dessert with vanilla wafers, fresh pastry cream, and chocolate ganache! The combination is delicious together and perfect for any special occasion like a birthday celebration! Doesn’t this look super enticing? Maybe even a little intimidating, but I’m here to tell you that this eclair dessert comes together beautifully without a whole lot of work. Promise! 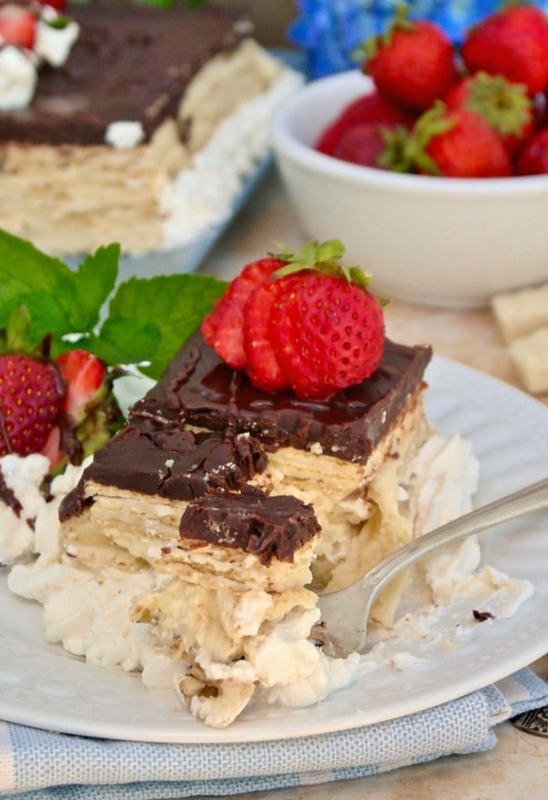 The cake portion of this dessert is made from Voortman Bakery vanilla wafers. These light and delicious cookies tastes delicious right out of the package, but when used as a cake base and combined with homemade vanilla pastry cream, and then topped with chocolate ganache…Oh, the dessert angels have arrived! Is your mouth watering yet? We’ve taken the cookies to a whole new scrumptious level. Like any good dish, it’s important to use quality ingredients for the best tasting results. With Voortman’s wafers, you’ll be glad to know that all their cookies are made with real ingredients! No artificial colors or high fructose corn syrup are in their cookies. Thank goodness they see the value in creating the best tasting wafer for us! Stay away from the fake, cheap stuff as much as possible! Each crispy wafer is made with real vanilla, so using the same high quality ingredients when making the rest of the cake only seemed natural. The pastry cream and ganache is from my Boston Cream Pie, and both are simple to make. There is a real vanilla bean used to make the pastry cream, but if you can’t get your hands on one, just be sure to use an extra dash of good quality vanilla extract. Of course, homemade vanilla extract is best! 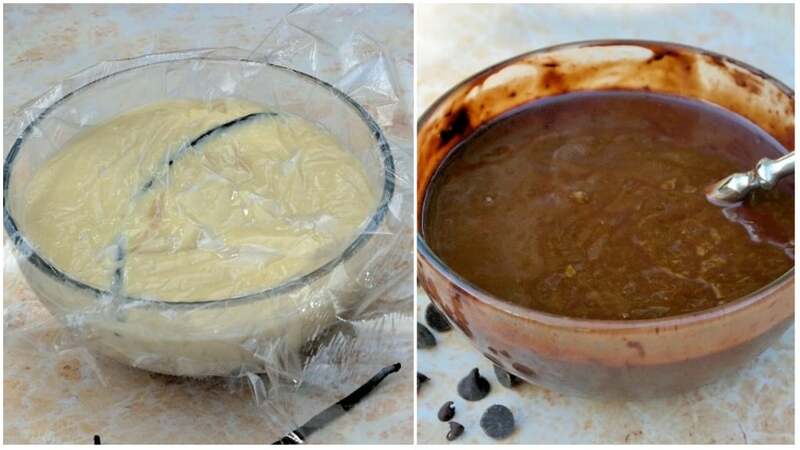 Allow some time to cool the pastry cream in the refrigerator. The cream can also be made a day in advance. The chocolate ganache should be made when assembling the cake. The cake is assembled in a 8″ X 8″ square pan. I lined it with parchment paper so that it could be removed and placed on a platter, but you may like to serve this cake right out of the pan! 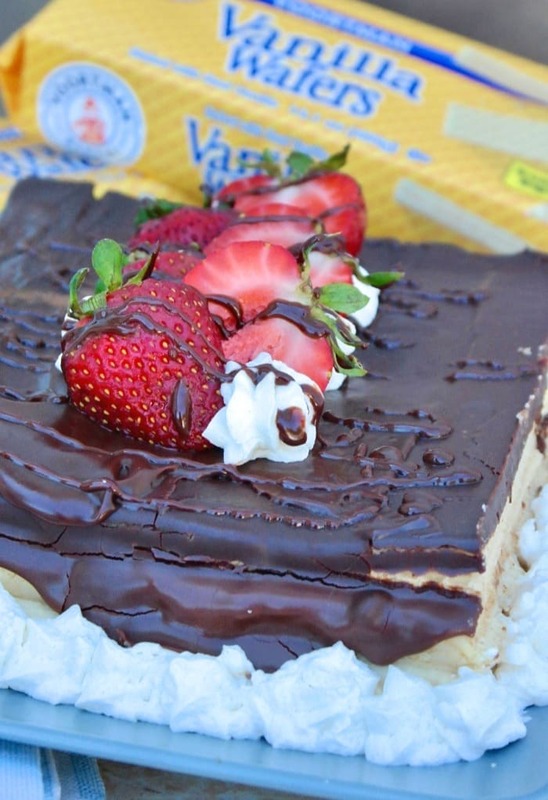 I used three layers of vanilla wafers for this eclair cake. The first layer serves as a base, then I spread half of the pastry cream before adding another layer of cookies. Repeat the process and top with chocolate ganache. Next add fresh fruit and whipped cream if you would like! One tip that I think is worth noting is to pay attention to how you place each cookie and try to mimic the same pattern in each layer. Follow the same lines when cutting to serve a slice of cake. Also make sure you use a sharp knife when cutting the dessert. There are lots of layers to cut though and a sharp knife will help avoid smooshing all the layers together. 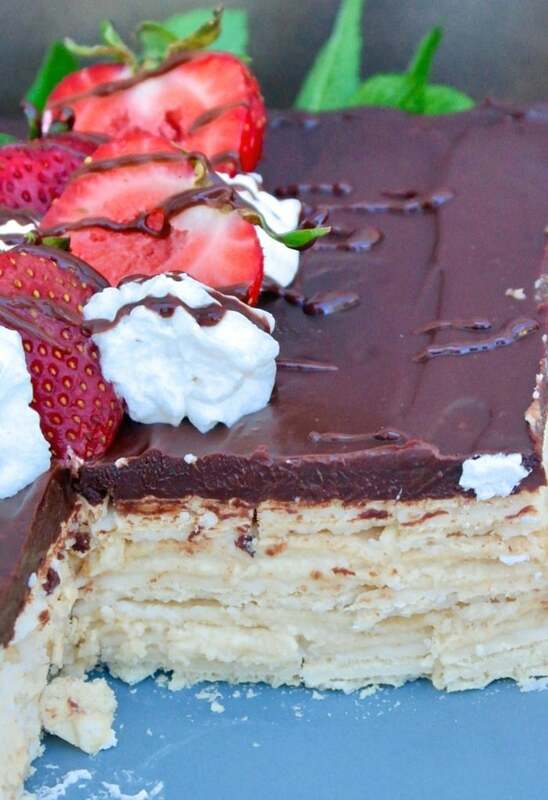 Grab the ingredients to make this eclair dessert today! 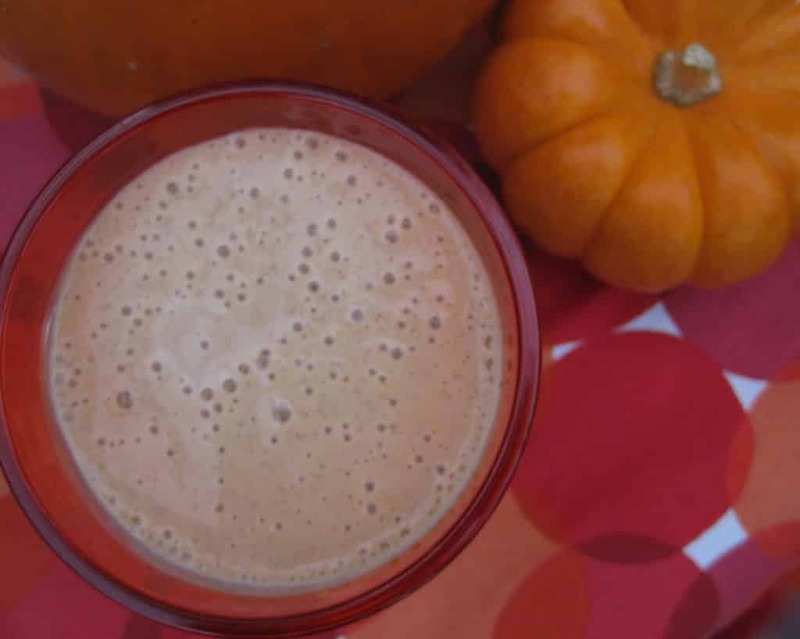 You will love all the delicious flavors together and it’s so simple to make! P.s. not that we are counting in this decadent dessert, but for low carb followers, each vanilla cookie wafer is only 3 carbs each! 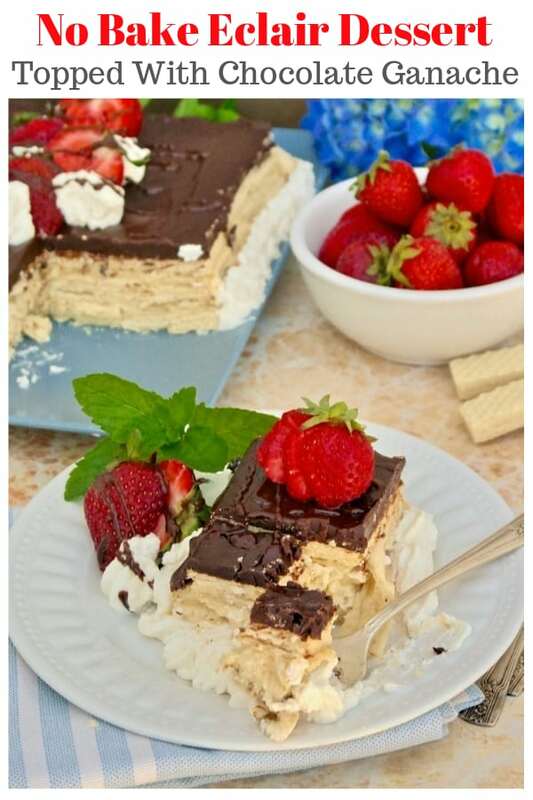 No bake eclair cake with layers of vanilla wafers, homemade pastry cream and chocolate ganache. Top with fresh fruit and whipped cream and serve for any special occasion. Line a 8" X 8" pan with parchment paper and set aside. Bring half and half to a simmer over medium heat in a medium saucepan. In a separate medium bowl whisk together sugar, eggs, egg yolk and flour to blend. Add warm half and half whisking into egg mixture. Return to saucepan and whisk over medium heat. Add split vanilla bean. Cook for about 5 minutes and let mixture get to a boiling point and let boil for 1 minutes. Remove from heat and stir in vanilla extract. Transfer to a small bowl and place plastic wrap directly on the pastry cream. Chill in the refrigerator. In a medium bowl break apart chocolate into small pieces and set aside. In a small saucepan over medium heat bring heavy whipping cream and butter to a boil. Pour over chocolate and mix until melted and smooth. 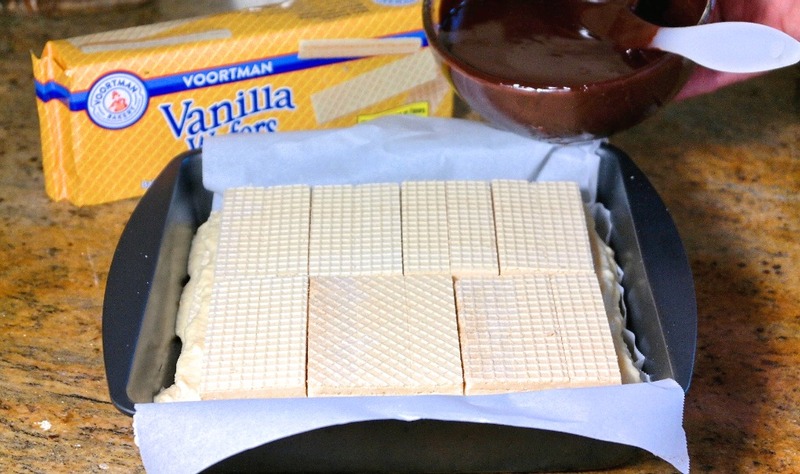 Place a layer of vanilla wafers on the bottom of the pan. Pour half of the pastry cream over the wafers and spread evenly. Repeat layering using the remaining pastry cream, and finish with a third layer of vanilla wafers. Top with ganache and let set in the refrigerator. Top with fresh fruit and add whipped cream if desired. The vanilla pastry cream needs to be chilled for at least four hours before assembling the cake. Make this first or can me made a day ahead. Dessert is best if enjoyed the same day it was assembled. Sandra, we have never made homemade eclairs and I cannot tell you why! This looks so easy and equally decadent. Our kids will love this recipe; thanks so much for another beautiful idea! I absolutely love vanilla wafers! Haven’t had them in forever. This recipe is right up my alley with being no make and layer upon layer of deliciousness! Holy wow… I need to find these vanilla wafers. What a great idea to use them in a homemade dessert! Takes all the hard work out of a super yummy impressive dessert! How have I never not made a dessert with these cookies?? They are my hubby’s favorite, and they remind him of his grandma. She always called them ice cream cookies. 🙂 . Totally making this! This is such a gorgeous dessert! I love that it is no bake!